Very quickly we shall go over the trends in properties of group 2 elements using the below table. The atomic radii increase down the group. This is because new electron shells are added to the atom, making it larger. The first inoisation energies decrease down the group, this is because there is more electron shielding and a greater distance of the outermost electrons from the nucleus. The electronegativity decrease down the group because the nuclear charge has less affect on the outermost electrons, so the atom will more readily give them up. When added to water, the first alkaline earth metal (Beryllium) is totally unreacative, and doesn't even react with steam. Then as you move down the group, the reactions become increasingly vigourous. As an example, the following reaction takes place between magnesium and water, an alkali earth metal hydroxide and hydrogen gas is produced. Magnesium can be substituted for any group 2 metal however. When magnesium is reacted with steam, it is even more vigourous, and instead of a hydroxide, an oxide is produced as well as hydrogen gas. Here we shall look at the solubilities of the hydroxides and sulphates of group II metals. Solubility is the maximum amount a substance will dissolve in a given solvent. It measured in either, grams or moles per 100g of water. Magnesium hydroxide (Mg(OH)2) is said to be sparingly soluble because it does not dissolve in very well and Be(OH)2 and BaSO4 are insoluble. The chemical test for a sulphate is to add Barium Chloride. 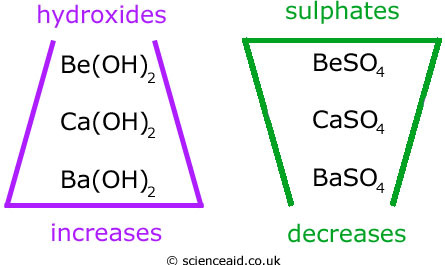 If positive the solution will go milky, this means the precipitate barium sulphate has been formed; which, as you can see from the solubility table above, this is insoluble. Beryllium differs from its broters and sisters in Group II in that it usually forms covalent bonds. But unlike other covalent molecules, it is soluble in organic solvents and a poor conductor when molten.